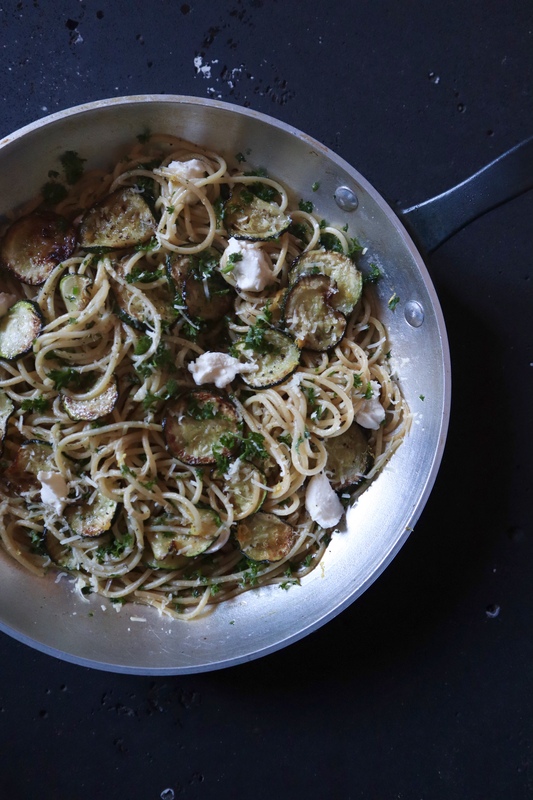 Delicious garlicky, lemony spaghetti with golden coins of fried zucchini and creamy ricotta. Simple and so tasty, it feels like a little bit of summer on a plate that can be enjoyed at any time of the year. To make, add spaghetti to a salted boiling pot of water and cook until al dente. While the spaghetti is cooking shallow fry zucchini coins in olive oil until golden. In the last 45 seconds add the crushed garlic and then remove the zucchini from heat. Add the lemon juice, lemon zest and parsley to the zucchini and set aside. Once spaghetti is cooked, drain and gently toss through zucchini mix. Season with salt and pepper and serve with dollops of ricotta and grated Romano cheese. Enjoy! Looks gorgeous, I shall try this! This caught my eye! Ricotta and lemon made me want to get into the kitchen! Dinner tonight for sure!